When a young patient came to Mayo Clinic in Jacksonville, Fla. with a benign tumor in his right cheek earlier this year, doctors knew surgery was necessary. The lesion, known as a nerve sheath tumor, was causing debilitating headaches, and prior surgery at another institution had been unsuccessful. A relatively rare tumor, the usual surgery prescribed for this condition would be complicated. The tumor was at the base of the skull and the typical approach would have involved a multi-hour surgery, significant facial incision, substantial blood loss and a high risk for complication. In addition, the patient would lose several teeth and have considerable post-operative scarring. John Casler, M.D., Chair of Otorhinolaryngology (ENT), considered alternative approaches and settled on one he thought would minimize risk and achieve the best outcomes. But he wasn’t sure it would provide him the right access or exposure to the tumor. 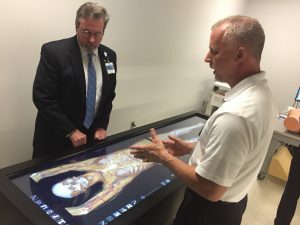 Collaborating with colleagues at the J. Wayne and Delores Barr Weaver Simulation Center, Dr. Casler and his team used a 3-D multimedia device known as an Anatomage table, to visualize the tumor and the surrounding tissues and to walk through the actual procedure. The table converts the multiple cross sections of traditional CT and MRI images into a 3D model which physicians and surgeons can manipulate to better understand the individual patient's anatomy, and the location of tumors in relation to nerves and blood vessels. The team was able to identify potential complications and develop a plan to ensure the best outcomes. In early April the patient underwent surgery successfully – in less time than originally thought and without surprises.